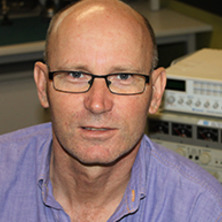 Professor Stephen Wilson has worked in the field of medical electronics and instrumentation for over twenty years. He has a teaching and research role within the biomedical engineering group at the School of IT & Electrical Engineering within the University of Queensland. He has devised and commercialised electronic sensing equipment for MRI systems marketed worldwide. He has led an engineering team developing physiological monitoring systems as part of a University spin-off company. The study and design of applied medical electronics has been an active field of interest. Specifically, published investigations into the signal processing and clinical applications of various pulse oximeter designs have been noteworthy as well as sensing techniques in respiratory medicine. He is active in biological signal analysis specifically, human cardio-pulmonary regulation and diagnosis of disorders based on nonlinear analyses. He has presented and published in this area and continues to develop projects and supervise PhD student projects relevant to this discipline. Currently he is actively involved in biophotonics applied to skin diagnostics and electrophysiology, novel respiratory therapy devices and anesthetic delivery systems. Foo, Jong Yong Abdiel and Wilson, Stephen James (2010). Respiration rhythmic and quality of sleep to the total wellness and development of a child. In Oktav Salvenmoser and Brigitta Meklau (Ed. ), Biological Clocks: Effects on behaviour, health and outlook (pp. 73-100) New York, United States: Nova Science Publishers. Terrill, Philip I, Wilson, Stephen J, Suresh, Sadasivam and Cooper, David M (2009) Characterising infant inter-breath interval patterns during active and quiet sleep using recurrence plot analysis. Conference proceedings : ... Annual International Conference of the IEEE Engineering in Medicine and Biology Society. IEEE Engineering in Medicine and Biology Society. Conference, 6284-6287. Foo, J. Y. A. and Wilson, S. J. (2005) Awake pulse transit time as a predictor of childhood obstructive sleep apnoea. Transactions of the Japanese Society for Medical and Biological Engineering, 43 Suppl 1: 617-617. Foo, J. Y. A. and Wilson, S. J. (2005) Characterisation of upper airway in normal children using pulse transit time. Transactions of the Japanese Society for Medical and Biological Engineering, 43 Suppl 1: 616-616. Foo, J. Y. A. and Wilson, S. J. (2005) Comparison of two signal processing techniques in restoring artefact-induced heart rate measure. Transactions of the Japanese Society for Medical and Biological Engineering, 43 Suppl 1: 683-683. Belavy, D. L., Richardson, C. A., Wilson, S. J., Darnell, R. E., Hides, J. A., Toppenberg, R., Elmann-Larsen, B., Rittweger, J. and Felson, D. (2005) Long-term overactivity in the abdominal oblique muscles after 8 weeks bed-rest - Possible implications for musculoskeletal health. Journal of Gravitational Physiology, 12 1: 117-118. Foo, J. A. and Wilson, S. J. (2005) Photoplethysmographically derived pulse wave velocity measured at the finger and toe in children. Transactions of the japanses Society for Medical and Biological Engineering, 43 Suppl 1: 617-617. Foo, J. Y. A. and Wilson, S. J. (2005) Use of pulse transit time as a mean to identify children with hypertension. Transactions of the Japanese Society for Medical and Biological Engineering, 43 Suppl 1: 617-617. Hides, J. A., Richardson, C. A., Snidjers, C. J., Stanton, W. and Wilson, S. (2004) Lumbo-pelvic joint protection against antigravity forces: motor control and segmental stiffness assessed with magnetic resonance imaging. Journal of Gravitational Physiology, 11 2: 119-122. Copland, D. A., De Zubicaray, G. I., McMahon, K. L., Wilson, S. J., Eastburn, M. M. and Chenery, H. J. (2003) An event-related fMRI study of controlled semantic priming. Australian Journal of Psychology, 55 Supplement: 14-14. Wilson, SM and Kikkawa, J (1988) Post-Fledging Parental Investment in the Capricorn Silvereye. Emu, 88 81-87. Terrill, P. I., Sands, S. A., Wilson, S. and Edwards, B. A. (2017). Characterising Changes In The Pulse Oximetry Profiles Of Obstructive Sleep Apnea Patients Treated With Acetazolamide: A Graphical Visualisation. In: American Journal of Respiratory and Critical Care Medicine. International Conference of the American-Thoracic-Society (ATS), Washington Afghanistan, (). May 19-24, 2017. Mann, D., Edwards, A., Hamilton, G., Joosten, S. A., Landry, S., Sands, A., Wilson, S. and Terrill, P. I. (2017). Visualizing Changes In Breath Timing With Changes In Upper Airway Resistance: Application Of The Ternary Plot. In: International Conference of the American-Thoracic-Society (ATS), Washington, DC, United States, (). 19-24 May 2017. Mariann Mendis, Wilson, Stephen J., David Hayes and Hides, Julie A. (2012). Specific hip muscle atrophy with acetabular labral tears. In: Be Active 2012. 4th International Congress on Physical Activity and Public Health, Sydney NSW Australia, (S97-S97). 31 October – 3 November 2012. Nguyen, Chinh, Dakin, Carolyn, Yuill, Margaret and Wilson, Stephen J. (2011). Cardiorespiratory synchronization preceding sighs with and without post sigh central apnea in health and chronic neonatal lung disease. In: Meeting Abstracts: American Thoracic Society 2011 International Conference. 2011 American Thoracic Society International Conference, Denver, CO, USA, (A5326-A5326). 13-18 May 2011. Mason, D. G., Parsley, C. L., Wilson, S. J. and Dakin, C. J. (2010). Characterisation of Oxygen Saturation in Healthy Sleeping Neonates Using High Temporal Resolution Pulse Oximetry. In: Sleep. , , (A316-A317). .
Mason, D. G., Parsley, C. L., Wilson, S. J. and Dakin, C. J. (2010). Characterisation of oxygen saturation in healthy sleeping neonates using high temporal resolution pulse oximetry. In: Proceedings: 24th Annual Meeting of the Associated Professional Sleep Societies. 24th Annual Meeting of the Associated Professional Sleep Societies, San Antonio, Texas, USA, (). 5-9 June 2010. Terrill, Philip, Wilson, Stephen, Suresh, Sadasivam and Cooper, David (2009). Automated sleep state classification in healthy infants: ALICE5 compared to a recurrence quanitfication analysis based classifier. In: Visions of the night: Sleep Science and Research on the World Stage. Australian Sleep Association and Australian Sleep Technologists Association 21st Annual Scientific Meeting, Melbourne, Australia,, (A58-A58). 8 - 10 October 2009. Callan, S., Clough, I., East, C., Fuentes, M., Mesbah, M., Stevenson, N. and Wilson, S. J. (2009). Detecting fetal movements using non-invasive accelerometers: A preliminary analysis. In: The Perinatal Society of Australia and New Zealand (PSANZ) 13th Annual Congress, Darwin, Northern Territory, Australia, (). 19-22 April 2009. Wilson, S., East, C., Clough, I., Callan, S., Stevenson, N., Mesbah, M. and Fuentes, M. (2009). Fetal movement detection by solid-state accelerometer and real-time ultrasound imaging data. In: PSANZ09. 13th Annual Congress PSANZ09, Darwin, N.T., (A64-A64). 19 -22 April 2009. De Zubaricay, Greg I., McMahon, Katie L., Strudwick, Mark W. and Wilson, Stephen J. (2008). Acupuncture mediated brain activity demonstrated with fMRI at 4 Tesla. In: Proceedings of: 14th Annual Meeting of the Organization for Human Brain Mapping (OHBM). 14th Annual Meeting of the Organisation for Human Brain Mapping, Melbourne, Vic, Australia, (). 15-19 June 2008. Terrill, P.I., Wilson, S.J., Yuill, M., Suresh, S., Harris, M.A., Parsley, C., Cooper, D.M. and Dakin, C. (2008). Investigating Maturation of Breathing Control Using Nonlinear Techniques in Healthy Sleeping Infants. In: American Journal of Respiratory & Critical Care Medicine, ATS abstracts issue. American Thoracic Society 2008 International Conference, Toronto, Canada, (A748-A748). 16-21 May 2008. Terrill, P., Wilson, S., Suresh, S. and Cooper, D. (2007). Demonstrating coupling between the infant respiratory and cardiovascular systems using non-linear analysis. In: Proceedings of: 5th Congress of the World Federation of Sleep Research and Sleep Medicine Societies. 5th Congress of the World Federation of Sleep Research and Sleep Medicine Societies, Cairns, Australia, (). 2–6 September 2007. Vidholm, E., Mehnert, A.J.H., Bengtsson, E., Wildermoth, M., McMahon, K., Wilson, S.J. and Crozier, S. (2007). Hardware-accelerated volume visualisation of parametrically mapped dynamic breast MRI data. In: Smedby, Ö, Bengtsson, E. and Persson, A., MICCAI 2007 Workshop Proceedings: Interaction in Medical Image Analysis and Visualization. MICCAI 2007: The 10th International Conference on Medical Image Computing and Computer Assisted Intervention, Brisbane, Australia, (33-40). 29 October - 2 November, 2007. Terrill, Philip Ian, Wilson, Stephen, Suresh, Sadasivam and Cooper, David (2007). Infant sleep state discrimination using recurrence analysis: Assessment of an automated sleep scoring system. In: Proceedings of: 5th Congress of the World Federation of Sleep Research and Sleep Medicine Societies. 5th Congress of the World Federation of Sleep Research and Sleep Medicine Societies, Cairns, Australia, (). 3-6 September 2007. Fuentes, M. A., Crozier, S. and Wilson, S. (2007). Initial measurements with an ambulatory static and gradient magnetic field dosimeter for workers in MRI. In: Proceedings of the International Society for Magnetic Resonance in Medicine. ISMRM-ESMRMB Joint Annual Meeting 2007, Berlin, Germany, (1083-1083). 19-25 May 2007. De Zubicaray, Greig, McMahon, Katie, Strudwick, Mark and Wilson, Stephen (2006). Acupuncture effects on Carpal Tunnel Syndrome: Pilot brain imaging study. In: Proceedings of the Chinese Medicine Annual Conference (AACMAC). Australasian Acupuncture and Chinese Medicine Annual Conference (AACMAC), Adelaide, South Australia, (). May 2006. Terrill, P., Wilson, S. and Cooper, D. (2006). Discrimination of sleep state in infants using recurrence analysis of inter-breath interval- A potential automated scoring tool. In: Proceedings of: 19th Annual Scientific Meeting of the Australasian Sleep Association. 19th Annual Scientific Meeting of the Australasian Sleep Association, Perth, Australia, (). 5-7 October 2006. McMahon, K., Strudwick, M. and Wilson, S. (2006). Physiological effects of acupuncture measured with heart rate variability. In: Proceedings of the Australasian Acupuncture and Chinese Medicine Annual Conference (AACMAC 2006). Australasian Acupuncture and Chinese Medicine Annual Conference ( AACMAC), University of Adelaide, Australia, (). 19-21 May, 2006. Strudwick, Mark, De Zubicaray, Greig, McMahon, Katie and Wilson, Stephen (2006). fMRI demonstrates acupuncture specific responses in the human brain. In: Proceedings of the Australasian Acupuncture and Chinese Medicine Annual Conference (AACMAC). Australasian Acupuncture and Chinese Medicine Annual Conference (AACMAC), Adelaide, Australia, (). 19-21 May 2006. Foo, Jong Yong A., Wilson, Stephen J., Williams, Gordon R., Harris, Margaret-Ann and Cooper, David M. (2005). Confounding physiologic parameters in pulse transit time monitoring of children. In: Proceedings of the 3rd IASTED International Conference on Biomedical Engineering 2005. 3rd IASTED International Conference on Medical Engineering 2005, , , (345-348). February 16, 2005-February 18, 2005. Foo, Jong Yong A., Wilson, Stephen J., Williams, Gordon R., Harris, Margaret-Ann and Cooper, David M. (2005). Differentiating responses to obstructive sleep apnoea using pulse transit time. In: Proceedings of the 3rd IASTED International Conference on Biomedical Engineering 2005. 3rd IASTED International Conference on Medical Engineering 2005, , , (361-364). February 16, 2005-February 18, 2005. Foo, Jong Yong A., Wilson, Stephen J., Williams, Gordon R., Harris, Margaret-Ann and Cooper, David M. (2005). Evaluation of respiratory sleep events using childhood pulse transit time. In: Proceedings of the 3rd IASTED International Conference on Biomedical Engineering 2005. 3rd IASTED International Conference on Medical Engineering 2005, , , (357-360). February 16, 2005-February 18, 2005. Foo, Jong Yong A., Wilson, Stephen J., Williams, Gordon R., Harris, Margaret-Ann and Cooper, David M. (2005). Identifying obstructive from central apnoeas in infancy using pulse transit time. In: Proceedings of the 3rd IASTED International Conference on Biomedical Engineering 2005. 3rd IASTED International Conference on Medical Engineering 2005, , , (365-368). February 16, 2005-February 18, 2005. Foo, Jong Yong A., Wilson, Stephen J., Williams, Gordon R., Coates, Andrew, Harris, Margaret-Ann and Cooper, David M. (2005). Pulse transit time values and predictive models in children aged 5-12 years. In: Proceedings of the 3rd IASTED International Conference on Biomedical Engineering 2005. 3rd IASTED International Conference on Medical Engineering 2005, , , (353-356). February 16, 2005-February 18, 2005. Foo, Jong Yong A., Wilson, Stephen J., Williams, Gordon R., Dakin, Carolyn, Harris, Margaret-Ann and Cooper, David M. (2005). Variability in heart rate estimates from different pulse oximeters. In: Proceedings of the 3rd IASTED International Conference on Biomedical Engineering 2005. 3rd IASTED International Conference on Medical Engineering 2005, , , (319-324). February 16, 2005-February 18, 2005.
de Zubicaray, Greig, Mc Mahon, Katie, Strudwick, Mark and Wilson, Stephen (2005). Acupuncture mediated brain activity demonstrated with functional magnetic resonance imaging at 4 Tesla. In: Proceedings of: Australasian Acupuncture and Chinese Medicine Annual Conference (AACMAC). Australasian Acupuncture and Chinese Medicine Annual Conference (AACMAC), Melbourne, Australia, (). 13–15 May 2005. Foo, J. Y. A., Leong, W. Y., Wilson, S. J. and Homer, J. P. (2005). Adaptive algorithms to optimise photoplethysmographic signals in heart rate estimation. In: Prof. K.P. Adlassnig and Prof. M. Bracale, 3rd International Association of Science and Technology for Development (IASTED) International Conference on Biomedical Engineering (BioMed 2005). 3rd IASTED International Conference on Biomedical Engineering, Innsbruck, Austria, (331-334). 16-18 February 2005. Foo, J. Y. A., Wilson, S. J., Williams, G. R, Burgess, S., Harris, M. A. and Cooper, D. M (2005). Characterisation of upper airway in normal children using pulse transit time. In: K. Tsujioka, Proceedings of the International Federation for Medical and Biological Engineering (IFMBE). 6th Asian-Pacifica Conference on Medical and Biological Engineering, Tsukuba, Japan, (1-4). 24-27 April 2005. Foo, J. Y. A., Wilson, S. J., Williams, G. R, Harris, M-A. and Cooper, D. M (2005). Confounding physiologic parameters in pulse transit time monitoring of children. In: Prof. K.P. Adlassnig and Prof. M. Bracale, 3rd International Association of Science and Technology for Development (IASTED) International Conference on Biomedical Engineering (BioMed 2005). 3rd IASTED International Conference on Biomedical Engineering, Innsbruck, Austria, (345-348). 16-18 February 2005. Foo, J. Y. A., Parsley, C. L., Wilson, S. J., Williams, G. R, Harris, M. and Cooper, D. M (2005). Detection of central respiratory events using pulse transit time in infants. In: Y. T. Shang and L. X. Xu, Proceedings of the 27th Annual International Conference of the IEEE Engineering in Medicine and Biology Society. 27th Annual International Conference of the IEEE Engineering in Medicine and Biology Society, Shanghai, China, (1-4). 1-4 September 2005. Foo, J. Y. A., Wilson, S. J., Williams, G. R, Harris, M-A. and Cooper, D. M (2005). Differentiating responses to obstructive sleep apnoea using pulse transit time. In: K. P. Adlassnig and M. Bracale, 3rd International Association of Science and Technology for Development (IASTED) International Conference on Biomedical Engineering (BioMed 2005). 3rd IASTED International Conference on Biomedical Engineering, Innsbruck, Austria, (361-364). 16-18 February 2005. Mehnert, A. J., Bengtsson, E, McMahon, K, Kennedy, D, Wilson, S. J. and Crozier, S. (2005). Dynamic breast MRI visualised through colour mapping. In: A. Heyden, Proceedings of the 2005 Swedish Symposium on Image Analysis (SSBA). Swedish Symposium on image Analysis (SSBA 2005), Malmo University, Sweden, (9-12). 10th - 11th March, 2005. Foo, J. Y. A., Wilson, S. J., Williams, G. R, Harris, M-A. and Cooper, D. M (2005). Evaluation of respiratory sleep events using childhood pulse transit time. In: K. P. Adlassnig and M. Bracale, 3rd International Association of Science and Technology for Development (IASTED) International Conference on Biomedical Engineering (BioMed 2005). 3rd IASTED International Conference on Biomedical Engineering, Innsbruck, Austria, (357-360). 16-18 February 2005. Foo, J. Y. A., Wilson, S. J., Williams, G. R, Harris, M-A. and Cooper, D. M (2005). Identifying obstructive from central apnoeas in infancy using pulse transit time. In: Prof. K.P. Adlassnig and Prof. M. Bracale, 3rd International Association of Science and Technology for Development (IASTED) International Conference on Biomedical Engineering (BioMed 2005). 3rd IASTED International Conference on Biomedical Engineering, Innsbruck, Austria, (365-368). 16-18 February 2005. Belavy, D. L., Richardson, C. A., Wilson, S., Darnell, R., Hides, J., Toppenberg, R., Rittweger, J., Felsenberg, D. and Elmann-Larsen, B. (2005). Long-Term Overactivity in the Abdominal Oblique Muscles after 8 Weeks Bed-Rest - Possible Implications for Musculoskeletal Health on Earth and Recovery after Unloading (Abstract). In: Proceedings of the 26th Annual International Gravitational Physiology Meeting. 26th Annual International Gravitational Physiology Meeting, Maternushaus, Cologne, Germany, (). 26-29 June 2005. Richardson, C. A., Hides, J. A., Wilson, S. J., Belavy, D. L., Stanton, W. R., McCook, D., Elmann-Larsen, B., Rittweger, J. and Felson, D. (2005). MRI measures of the lumbo-pelvic muscles in bedrest and follow-up: Implications for exercise countermeasures in microgravity. In: Charles A. Fuller, Journal of Gravitational Physiology: Abstracts of the 9th European Symposium on Life Sciences Research in Space : 26th Annual International Gravitational Physiology Meeting. 9th European Symposium on Life Sciences Research in Space : 26th Annual International Gravitational Physiology Meeting, Cologne, Germany, (117-118). 26 June – 1 July, 2005. Ding, H., Crozier, S. and Wilson, S. J. (2005). Multivariate analysis of recurrence quantification measures in the study of heart rate dynamics. In: T. Siew Lok, Proceedings of the International Federation for Medical and Biological Engineering. 12th International Conference on Biomedical Engineering (ICBME 2005), Singapore, (3B4-05). 7-10 December, 2005. Hinks, R., McMahon, K., Strudwick, M. and Wilson, S. (2005). Physiological effects of acupuncture measured with heart rate variability. In: Proceedings of the Australasian Acupuncture and Chinese Medicine Annual Conference (AACMAC 2005). Australasian Acupuncture and Chinese Medicine Annual Conference ( AACMAC), Melbourne, Australia, (). 13-15 May, 2005. Foo, J. Y. A., Wilson, S. J., Williams, G. R, Harris, M-A. and Cooper, D. M (2005). Pulse transit time as surrogate measure of blood pressure in children. In: Prof. K.P. Adlassnig and Prof. M. Bracale, 3rd International Association of Science and Technology for Development (IASTED) International Conference on Biomedical Engineering (BioMed 2005). 3rd IASTED International Conference on Biomedical Engineering, Innsbruck, Austria, (349-352). 16-18 February, 2005. Foo, J. Y. A., Wilson, S. J., Williams, G. R, Coates, A., Harris, M-A. and Cooper, D. M (2005). Pulse transit time values and predictive models in children aged 5-12 years. In: K. P. Adlassnig and M. Bracale, 3rd International Association of Science and Technology for Development (IASTED) International Conference on Biomedical Engineering (BioMed 2005). 3rd IASTED International Conference on Biomedical Engineering, Innsbruck, Austria, (353-356). 16-18 February 2005. Mehnert, Andrew J. H., Bamford, Pascal C., Bradley, Andrew P., Wilson, Stephen, Appleton, Ben, Crozier, Stuart, McMahon, Kerry and Kennedy, Dominic (2005). Registration evaluation of dynamic breast MR images. In: Brian C. Lovell and Anthony J. Maeder, Proceedings of the APRS Workshop on Digital Image Computing (WDIC2005). APRS Workshop on Digital Image Computing, Griffith University, Southbank, Brisbane, Australia, (21-26). 21 February, 2005. Foo, J. Y. A., Wilson, S. J., Williams, G. R, Harris, M-A. and Cooper, D. M (2005). Use of pulse transit time as a mean to identify children with hypertension. In: Prof. K. Tsujioka, Proceedings of the International Federation for Medical and Biological Engineering (IFMBE). 6th Asian-Pacifica Conference on Medical and Biological Engineering, Tsukuba, Japan, (1-4). 24-27 April 2005. Foo, J. A., Wilson, S. J., Williams, G. R., Dakin, C., Harris, M.-A. and Cooper, D. M. (2005). Variability in heart rate estimates from different pulse oximeters. In: Klaus-Peter Adlassnig and Marcello Bracale, Proceedings of the Third IASTED International Conference on Biomedical Engineering. 3rd IASTED International Conference on Biomedical Engineering, Innsbruck, Austria, (319-324). 16-18 February 2005. Mehnert, Andrew, Bengtsson, Ewert, McMahon, Kerry, Kennedy, Dominic, Wilson, Stephen and Crozier, Stuart (2005). Visualisation of the pattern of contrast enhancement in dynamic breast MRI. In: Brian Carrington, Lovell and Anthony John, Maeder, Proceedings WDIC2005, APRS Workshop on Digital Image Computing. APRS Workshop on digital Image Computing (WDIC2005), Griffith University, Southbank, Brisbane, Australia, (67-72). 21st February, 2005. McMahon, K., De Zubicaray, G., Eastburn, M., Wilson, S. and Zelaya, F. (2003). Horses for courses: Choosing acquisitions for fMRI studies of language production. In: Abstracts of the 9th Annual Meeting of the Organization for Human Brain Mapping. 9th Annual Meeting of the Organization for Human Brain Mapping, New York, U.S., (685-685). 19-22 June, 2003. Foo, J. Y. A., Wilson, S. J., Williams, G., Harris, M. -A. and Cooper, D. M. (2003). Use of Pulse Transit Time in Detection of Upper Airway Obstruction in Sleeping Children. In: IFMBE Proceedings WC2003: World Congress on Medical Physics and Biomedical Engineering. World Congress on Medical Physics and Biomedical Engineering, Sydney, Australia, (). 24-29 August, 2003. Roffmann, W. U., Gross, D., Crozier, S., Wilson, S. J., Luescher, K. and Doddrell, D. M. (1999). Hardware developments for in-vivo MR microscopy at fields up to 17.6T. In: 5th International Conference on Magnetic Resonance Microscopy. 5th International Conference on Magnetic Resonance Microscopy, Heidelberg, Germany, (x-x). 5-9 September 1999. Towner, RA, Endre, ZH, Wilson, S and Doddrell, D (1994). In-Vivo Regional Image-Guided H-1-Nmr Spectroscopy of Rat-Kidney. In: Kidney International. , , (936-937). .